Contains fuse and transient suppressor to protect from current overload, voltage spikes. Dimmable in unison by toggling your common inline switch. 3 Way 12 Volt LED light bulb features new technology which combines enhanced light output with reduced energy consumption. 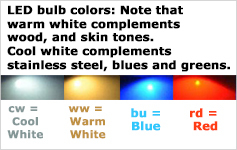 Replaces bi pin halogen or xenon bulbs found in rv lights or boat lights, and adds ability to set your light to 3 different levels of illumination (high / medium / low). Alternate between brightness levels by toggling power off, then back on. Switch must be inline (on fixture or wall mount). Switch NOT included. If you have several lights controlled by one switch, you can make them all dim in unison with these 12 volt 3 way LED bulbs (they all respond instantly and simultaneously when your switch is toggled). Dimmable by toggling your inline switch Off and back On. These 3 way bulbs are awesome! No need for a dimmer - Instead I just toggle my switch off, then back on, to step through to the intensity I want. Now I have bright light when I want it, and really nice soft light at night. I have 10 of these 3 way bulbs on one wall switch and they do work in perfect unison when I flip my switch. Very happy with these. Q: The pins are a bit longer than I need so is it ok to trim them? A: Yes you can trim the pins to suit your needs. Typically about 7/32" (just under 1/4") of pin length works well to give you a little extra wiggle room when installing, while still providing ample pin length to enter the socket.